Archer Daniels Midland Company Third-Quarter Earnings: Are Higher Margins Within Reach? 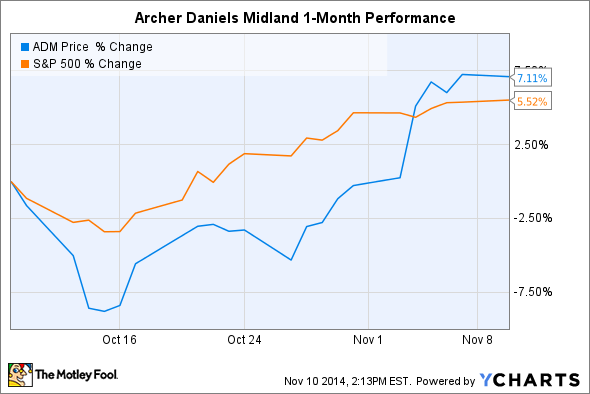 Now one week after earnings were announced, what should investors think about Archers Daniels Midland's progress and execution? Investors have had one week to digest Archer Daniels Midland's (NYSE:ADM) third-quarter earnings, which have pushed the stock up about 7%. While the results were largely positive and planted confidence in management's medium- and long-term vision for growth, there are still questions surrounding the company's ability to improve earnings in a sustainable manner given the overwhelming presence of low-value commodity products driving the business. In other words, there are many market variables outside of management's control that will always have the potential to sneak up on investors. What can you take away from Q3 earnings that demonstrates the opportunities and hurdles facing Archer Daniels Midland moving forward? The global food processing giant turned in a solid quarter of progress across the board. Total revenue dipped during the quarter compared to the same period last year, but shareholders enjoyed an increase in total gross profit. Archer Daniels Midland has three major reporting segments: (1) Oilseeds Processing, (2) Corn Processing, and (3) Agricultural Services. Operating income is virtually split evenly between the three, and none lost ground in the quarter compared to the same period in 2013. But which upticks were derived from short-term moves, and which from improvements with long-term staying power? Sustainable improvements: This continues to be a challenging segment for Archer Daniels Midland and competitors because of increased global capacity and volatile prices, which have greatly shifted market dynamics in recent years. There were really only two positives here. First, increased biodiesel production in North America pushed the company's refining, packaging, and biodiesel subsegment operating profit higher by 13% -- growth with long-term staying power. Second, the company found a buyer for its ailing global chocolate business and was able to retain its high-value specialty ingredients portfolio, ADM deZaan. Cargill will close the transaction for $440 million in the first half of next year. Temporary improvements: A big global increase in processing capacity weighed on margins yet again. While the division held tight and realized an operating profit of $362 million in the quarter (essentially matching the $361 million operating profit achieved in 2013), the biggest subsegment, Crushing and Origination, saw operating profit fall 11.5% on decreased volumes. Unfortunately, things may continue to get worse before they get better, considering the company has little flexibility when it comes to more efficiently monetizing its infrastructure and assets. Sustainable improvements: This was by far the best-performing division for Archer Daniels Midland, and there were two driving forces behind it. First, Sweeteners and Starches operating profit grew 58% compared to the same quarter in 2013, largely due to lower net corn costs. While market prices from a record crop certainly played a role in determining performance, the company can control specific costs related to sourcing and transportation. Better management of its logistics and transportation network can help funnel bulk corn to its Midwest processing facilities more efficiently, which is at least partially responsible for the recent gains. Temporary improvements: Second, Bioproducts operating profit soared 157% on higher demand and improved margins on its ethanol business (lower feedstock costs, again due to corn prices). Archer Daniels Midland is one of the nation's and world's largest ethanol producers, so it's not difficult to see that temporary gains or pullbacks in market conditions can have major impacts. While it's an important business, investors may want to pinch themselves and remember that volatility will remain a consistent risk for ethanol producers in the next few years. Sustainable improvements: A $60 million improvement in operating profit from Merchandising and Handling helped boost the segment's performance 56% compared to the same period last year. Archer Daniels Midland also executed on increasing the capacity utilization of its barge network -- and increased volumes means increased revenue and income. This will be a relatively boring, yet critical, part of improving the company's overall profitability. Temporary improvements: The company enjoyed a one-time increase in operating profit of $156 million from the expansion of a transportation and export joint venture with Marubeni. While the jump in income is temporary, the expansion will help boost margins and performance in the long run (see paragraph above). Investors should also applaud management's recent capital allocations, except for the share repurchase programs. In addition to closing a previously announced share buyback of 18 million shares in mid-October, Archer Daniels Midland expects to gobble up another 10 million shares before the end of the year. I'm not a big fan of share buybacks, as they artificially improve earnings and can give a false sense of progress. They're also not the best use of capital. Consider that the company's share purchases before the end of 2014 will cost $480 million assuming an average share price of $48. That essentially wipes away any benefits from the cocoa business sale to Cargill ($440 million) and only decreases diluted share count by 2%. Is that really the best $500 million investment available? Of course, management has made strategic investments, too, which shows that share buybacks are only part of the growth plan. Archer Daniels Midland has spent billions of dollars acquiring specialty ingredients companies WILD Flavors and Specialty Commodities, which will allow the company to sell high-value, high-margin products and offset risks from its exposure to commodity markets. What's the focus for investors? Overall, Archer Daniels Midland is executing on its strategy to provide long-term growth to investors. That will be difficult to do with the volatility and low margins of commodities the company relies on for large parts of its business, but improvements in operating efficiency and acquisitions of high-value, high-margin specialty products businesses show that progress is being made and, more important, looks like it will continue.